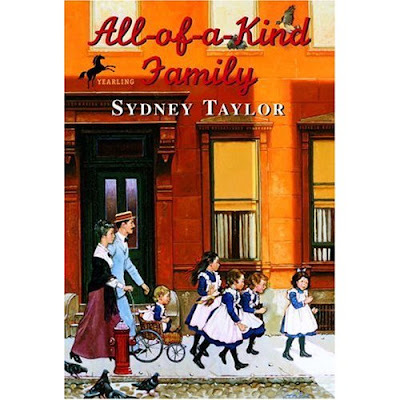 Everything about All-of-a-Kind Family was perfectly charming. It was refreshing to read about a family of girls for a change. We learned about many Jewish holidays and life in New York City. The mother was an angel. The illustrations were adorable. Adventure. Romance. What else can I say? As for the children, bedtime was something to which they looked forward. Bedtime was when Ella and Sarah, who slept together, built their imaginary house and decorated the beautifully rich and colorful make-believe rooms. Bedtime was when Charlotte made up fanciful stories to tell or thought up games to play with her bedfellow, Gertie. Bedtime was when Henny planned some special mischief she could carry on the next day in school or at home. Planned all by herself, because she did not like sharing a bed with anyone. They slept, all five of them, in the one room and that made for plenty of company in the dark. And what was the best of all, Mama never minded their talking to each other. "It's early enough and they're resting their bodies anyway," she said. "They'll fall asleep when they get tired." I LOVE All of a Kind Family! Have you read Cheaper By the Dozen? What a hoot! There are many more books in the All-of-a-Kind series. I'm currently reading the one you've just finished but I have read All-of-a-Kind Family Uptown which is just as charming as the first one. I am 42 and read the whole series over and over the summer I was 8. All 3 of my girls also love them! This is my most favorite series in the world. I mean that literally. If you knew how much I read and the way I am with favorites, you would know what a statement that is for me. So, I was really thrilled to see you feature my favorite here on your lovely blog. YIPPIE! !